Not exhaustive, nor complete, this map is a work-in-progress, documenting a community in-transition. For one afternoon in February 2010, we gathered together with a group of community members to create two distinct lists: Sites of Apology and Sites of Hope. The locations identified as part of these two lists were noted as being places for which we, as a community, might need to apologize to future generations, or places for which we might hold some particular hope of their role in creating a better city for future generations. Over the following weeks and months, we gradually visited every site on the list to (un)officially recognize it, demarcating it with a large ribbon and saying a few words about its designation. We encourage you to make your own visit to these sites. Thank you to everyone who contributed to the list and had such an incredible and engaged conversation with us that day. This map is long overdue, but we hope it was worth the wait. You can download the Sites of Apology / Sites of Hope Map (11″x17″). Back in January, we asked nearly 40 people two questions: Why did you first come to Windsor? and Why are you still here? We asked those questions at an event called, Listen to the City, which was the first part of the five-month long project, Save the City. It was an incredible night. The answers we got over the hour and a half we spent together at Phog Lounge in downtown Windsor presented not just answers to those two questions, but sprawling conversations about what it means to live in Windsor, how we’ve shaped this city, and how it’s shaped us. The five-minute edit you can listen to below is just a slice of everything that was talked about that night. Initially, we thought we might be able to cut a lengthier audio documentary together, but there were pragmatic implications that kept us from doing that. Hours of audio with conversations that covered more ground than we could have ever imagined meant that it was a lot more difficult to piece something much larger together. There were many voices that we unfortunately couldn’t include in the edit below, but only because of the amazing conversations those folks had, which in turn didn’t offer the kind of brief samples similar to those that we cut together. We added some music and tried to capture a general direction of conversation that we gathered from gradually listening to all of the conversations (Danielle took on the considerable task of doing just that and creating the assembly edit of this excerpt– hours and hours and hours of work, but we’re so excited to finally be able to share this). So, while this excerpt in no way does justice to the range of conversations that we had that night, we hope it might be a good introduction, or a good marker in time, of what a group of 40 Windsorites thought about this city at the start of 2010. Or you can also download the MP3 of Listen to the City. For good measure, we can also provide the original recordings in their entirety in a zip file if you’re interested. We make no promises about the audibility/legibility of every minute of these recordings, but if you have the time, they’re worth listening to as a whole. However, the zip file is over 700mb and so not easily uploaded to our servers. However, as promised, we will be officially handing over a copy of the five-minute excerpt and the raw audio files to the Windsor Archives soon. We need to sincerely thank everyone who came out that night and shared with us. 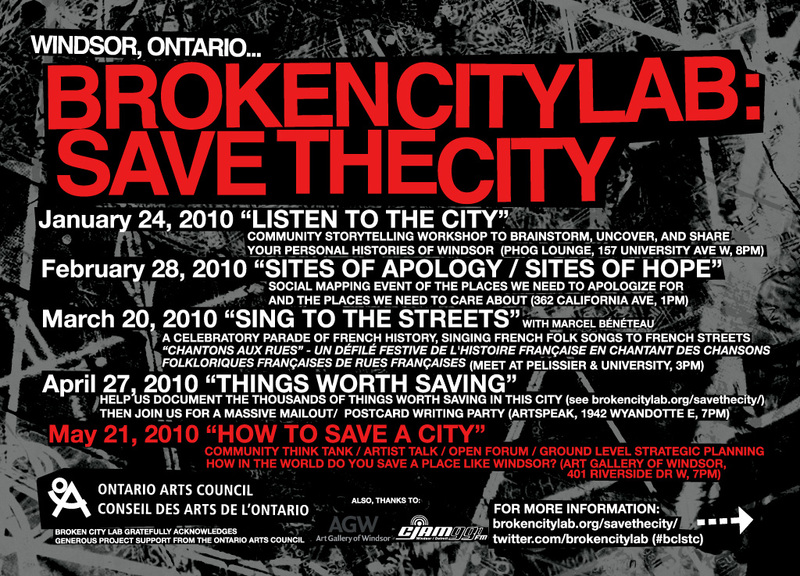 Broken City Lab: Save the City was generously supported by the Ontario Arts Council. 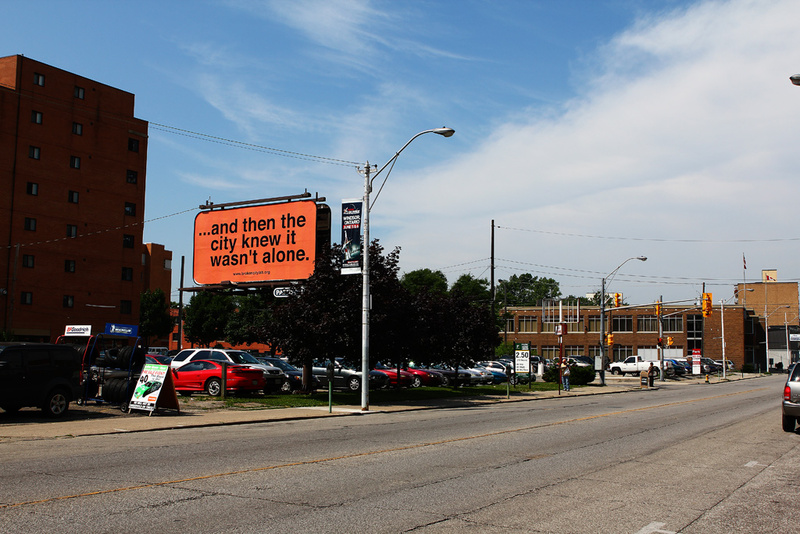 Though we’re still very much in the middle of thinking about, beginning to write about, and generally talk about all of the amazing things that we learned as part of Save the City, these billboards are the last part of the project to be launched. These two statements are among the many, many, many that we came up with after thinking through the experiences that we had and the people that we got to meet with Save the City, and maybe in particular, our final event, How to Save a City. I think we wanted to suggest the end of one part of a conversation and the beginning of another. In terms of our own research, I think we’re ready to start looking at problems in different ways, as a kind of continuum of ideas, rather than points from which to react. So, you can see these billboards in Windsor. 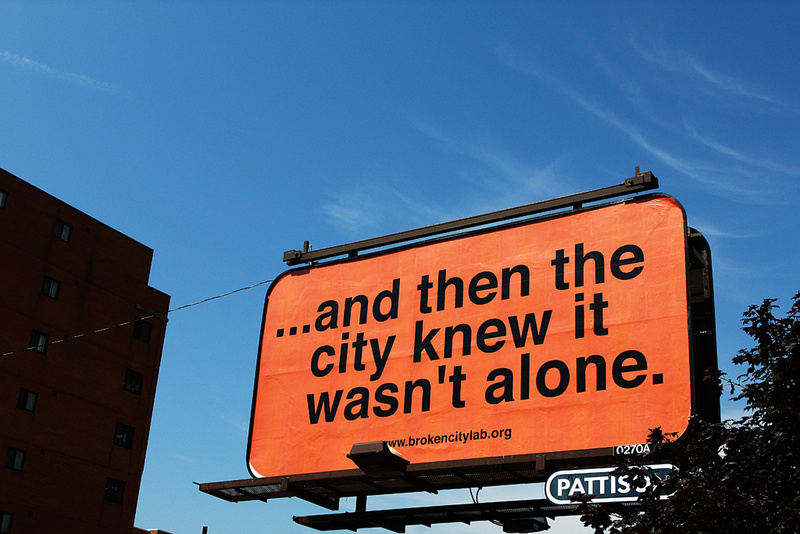 The first, “…and then the city knew it wasn’t alone.” is at University and Church, visible when traveling west. 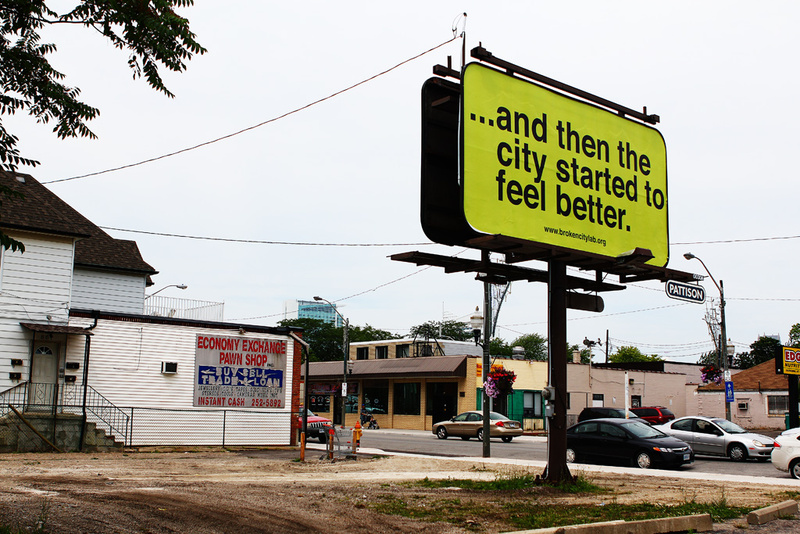 And the second, “…and then the city started to feel better.” is at Wyandotte and Parent, visible when traveling west. More ahead, and in the meantime, SRSI. 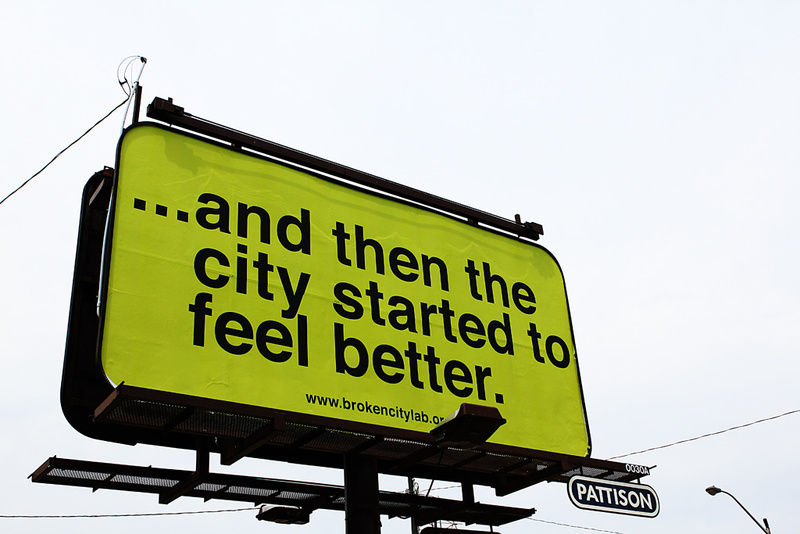 Broken City Lab: Save the City is generously supported by the Ontario Arts Council. Michelle and I spent hours and hours together yesterday. With everyone’s schedules fairly ridiculous at the moment, we’re trying to steal what little time we can to keep working. Lately, the time that we’ve all spent together has been framed exclusively almost exclusively by planning for Save the City or organizing the Storefront Residencies for Social Innovation, and so we’re usually burned out after a couple hours of that. Last night though, we pushed past the moment of getting burned out, and I think we got somewhere because of it. We started our Friday night with a Skype call to Chris from the Department of Unusual Certainties regarding their project as part of the Storefront Residencies for Social Innovation (they are very enthusiastic, and their projects is going to be really, really great), had some dinner, tried to imagine what will come after SRSI, and then moved on to sorting out the billboards for the last part of Save the City. We had a lot of bad ideas. Had we stopped earlier on, today and tomorrow would have been filled with some scrambling efforts to find the finish the design, emailing it out to everyone, trying to integrate everyone’s suggestions (and likely failing to do it well), sending it out again, getting more input, etc., etc., etc. Not entirely effective, nor can that process really capture the really great sparking moments of working together in the same room (the reason, I love collaborative work). We really want these billboards to not just cap off Save the City, not just describe or some how summarize what we’ve learned, but continue with this conversation that we’ve been having. So, we had some terrible ideas for a long while, but we moved through them, we wrote them all down, then crossed them all out eventually, and it was the process of doing that, of really talking about where we were trying to go without knowing where we were going that was entirely worth it. I think we started the billboard brainstorming around 7:30pm were ready to give up around 9pm and we were there until 11pm still finalizing things. And, they’re still not finalized yet, but they’re close. And we didn’t just brainstorm, we did the preliminary layout(s) together, we critiqued as we went, and it was so completely worth the exhaustion. Danielle called, thankfully, so we could check our work with someone outside of that room to make sure we hadn’t missed anything obvious, and then we were done, and we’re very, very excited to see these go up. I hope the summer allows more opportunities for this — a lot of time spent together doing things, working through problems together, in the same room, until we get somewhere better than where we started. The artwork goes out Monday, and I think the billboards launch mid-month. Though we have a lot more to say about Save the City than I’ll attempt right now, you should know that we put together a toolkit that describes the processes we figured out throughout the last five months. We put together a nice one-page fold up list of instructions, so to speak, for how one might take on similar tactics in (re)discovering their city, neighbourhood, block, or apartment building. Cristina wrote about the process a while back, and the toolkits turned out really, really, really well. Soon, we’ll be posting a downloadable PDF. The event last Friday was awesome. We had a really good turn out, we got to talk about and see (really for the first time) everything we’ve been doing so far this year all lined up together. Have we come to any conclusions? I’m not sure, but I know that we’ve begun to articulate some of the questions we’ve had for a long time, a little bit better. We’re hoping to put together a book by the end of the summer about all of this (and by all of this, I mean Save the City). We need to devote some time to really digging into discussing what the project has been and how it unfolded. In the meantime, we still have some billboard space to fill, expect to see some photos of those in the coming weeks. As well, we still need to put together a map for Sites of Apology / Sites of Hope. So, lots to do, and all while we prepare for the Storefront Residencies for Social Innovation!!! The Eco-House was bumpin’ Friday night! Amongst a slew of other undergoing projects, Michelle, Rosina, Josh and I we’re all hard at work, trying to get everything organized for our upcoming event and final installment of Save The City that’s taking place this Friday at the Art Gallery of Windsor! Rosina and I tackled the Save The City Micro Tool-Kits that will also be distributed THIS Friday night. We did everything from editing the recipes, to creating a layout, to drawing little doodles, and we’re very excited to share them with you! While Rosina and I were busy working away on one end of the table, Josh and Michelle were just as busy on the other end organizing and creating a calendar and list of needs for all the SRSI participants. …For the Save The City Micro Tool Kit! It will be distributed at our last event for Save The City, this Friday May 21st @ 7pm @ the Art Gallery of Windsor. A downloadable and printable version will also be available here, soon! The kit will include recipes to cook up some BCL-like civic engagement in your city! Though we’ve received a few of the postcards back because of a faulty address, for the most part, the 150 postcards sent out for Things Worth Saving, as part of our ongoing Save the City project, have likely now arrived to their destinations. I must admit that when I first laid eyes on the stacks upon stacks of postcards that we were fill and mail out that evening I yearned for my San Pellegrino to immaculately transform into Kentucky bourbon. Alas it did not, but thankfully that seemingly desperate moment revealed itself as fleeting as the lovely people who attended the event feverishly jot down their various anecdotes, love stories, musings and mini manifestos regarding Windsor. The writing was non stop – the sounds of the building and camera snaps were overpowered by the sounds of pencils, pens and markers scribbling effervescently. The details: Friday, May 21 at 7pm, Art Gallery of Windsor. For the past five months, we’ve been working on a series of events aimed at unfolding the stories, experiences, images, geography, buildings, folkloric histories, people, and places that make Windsor the city that it is. Perhaps you’ve come out to one of our community events in the Broken City Lab: Save the City series, or perhaps you’ve just read about it here, or maybe you’ve meant to come, but you haven’t been able to fit it into your schedule — in an case, this is going to be our final event as part of the project, and you should come. The things that we’ve learned from working with the community on creating audio documentaries, city-wide maps, sidewalk-parades, and postcards with hand-written letters have changed the way we think about this city, its past, and its future. So, we would like to cordially invite you to the final part of Save the City on May 21st at the Art Gallery of Windsor. We’ll be in or around the building depending on the weather, but either way, we promise we won’t be hard to find. We would like you to come out to share with us one more time some of the things that shape the way you think about Windsor — we’ll talk about what we’ve learned, we’ll ask you a bunch of questions, we’ll show you hundreds of photographs, and then we’ll ask you to help us come up with a message that we’ll then put up on a billboard (or two) somewhere in Windsor. We’re hoping that this message can say something to the city that needs to be said. Danielle and I have also been out finishing up documenting and officially recognizing the Sites of Apology / Sites of Hope across the city. You should expect a massive post on this soon… visiting 50 sites across the city takes a lot longer than we anticipated! We’re also trying to figure out where to host our final event of the Save the City project in May — any suggestions?